There's finally something fun to do in the run-up to that holiday of love, Valentine's Day. According to Parental Unit, eating chocolate nonstop just isn't enough! 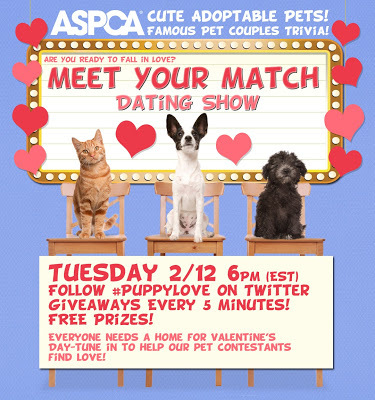 So tune in for a live streaming event hosted by the ASPCA called "Meet Your Match", where viewers can meet and hook up with some of the most eligible shelter pets who are looking for their forever homes. This dating show will be live streamed from 6:00-7:00pm, EST on Tuesday February 12, and you can tune in right here! And they'll be a Twitter party going on at the same time (hashtag #PuppyLove) to help spread awareness about adoption, with prizes every five minutes! 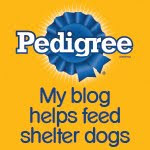 And we'll be giving away a special Valentine's Day Gift Pack to one lucky winner, courtesy of the ASPCA! 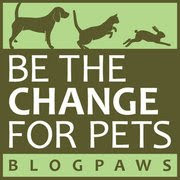 Don't miss this opportunity to join in the fun and spread the good word about the joys of pet adoption! What a great idea! I hope everyone finds their love and live happily ever after!